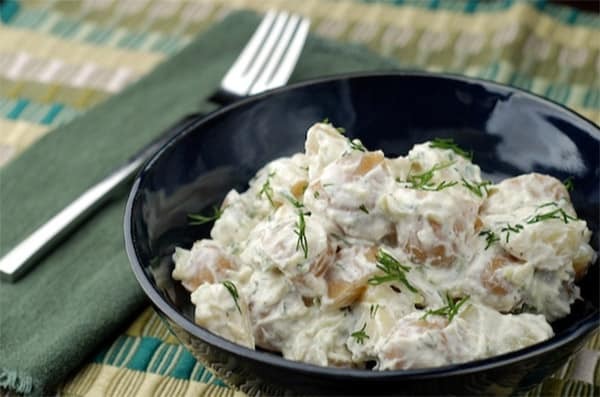 Not a lot of recipes can be compared to a good potato salad that goes perfectly with almost every main dish. Ground cumin will add a nice, vibrant touch, while the yoghurt provides the creaminess this salad is known for. If you have some spare time, prepare your potatoes in a charcoal grill instead of the oven – the result will be even better. Heat the oven to 200C. Place the potatoes on a baking tray and cook for 50-55 minutes until soft when squeezed and crisp on the outside. Meanwhile, to make the dressing, place the cumin in a small ovenproof dish, such as a ramekin and toast in the hot oven for no more than two minutes while the potatoes are baking. Do not let it burn. Remove from the oven and leave to cool. Stir together with cooled cumin, lemon juice and yoghurt in a small bowl and add pepper to taste. Cover and chill. Arrange the salad leaves on serving plates. When the potatoes are done remove from the oven and using an oven mitt for protection, quarter lengthways into wedges. Put five potato wedges on each plate. Drizzle the potatoes with the dressing and serve immediately.